FILEminimizer Suite compresses PowerPoint, Word, Excel, PDF and image files by 50-90% without zipping. 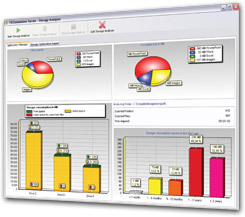 The software sports an intuitive interface and lets you optimize the size of your Office files (97-2010), PDF documents as well as your JPG, TIF, BMP, GIF, EMF and PNG image files without changing the native file format. The optimization is visually lossless preserving the original visual quality of a file at all times. It integrates into Microsoft Office and into your email program (supports Microsoft Outlook and Lotus Notes clients) to optimize your office and image attachments directly before sending. You can easily bypass email size limitations and won’t clog up your recipient’s inbox. It relieves Microsoft Exchange and Lotus Domino email servers by 50-90% optimizing the whole email infrastructure in corporations. You can download a free trial, please click HERE!. FILEminimizer Server compresses PDF files, the latest Microsoft Office 2010 files as well as image files in the formats JPG, TIFF, BMP, GIF, EMF and PNG directly on the file server from 50-90%. The original format is retained so that files can be opened and edited - without any decompression needed. With an average compression rate of over 70%, FILEminimizer Server helps IT Administrators to instantly gain back enormous storage space, save on data transfer and storage costs and shorten backup times. 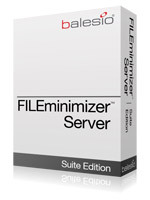 FILEminimizer Server is a professional storage solution which also helps you to enhance your deduplication strategies. If you are willing to start an evaluation of the FILEminimizer Server edition, please contact us at sales@unitedaddins.com. 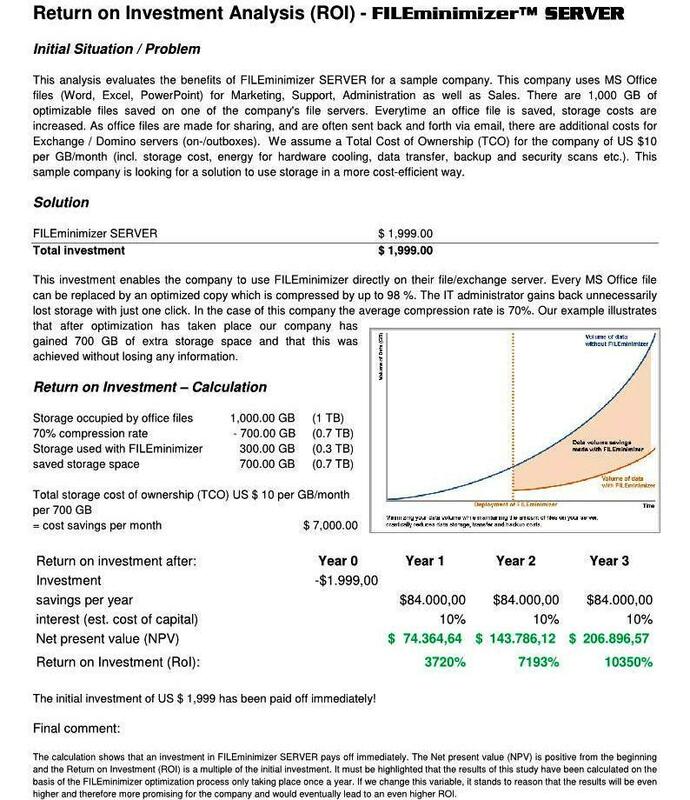 Immediate Return on Investment: positive ROI after a few months due to storage cost savings and data traffic reductions for the whole Microsoft SharePoint environment. If you are willing to start an evaluation of the FILEminimizer SharePoint edition, please contact us at sales@unitedaddins.com. Learn how FILEminimizer helps large U.S. Federal Agency reduce network traffic and email data storage in Microsoft Outlook environment by 70%. A lot of worldwide leading companies are already using our products. This price includes updates, upgrades and technical support via e-mail and telephone.